The city of New Orleans is one of many cities across the United States that have faced the threat of water privatization. This water privatization, however, would have been the largest contract of its kind in the nation involving a 20 year contract worth $1.5 billion  and would have led to negative consequences for the citizens of an already poor city facing. In 1998, the New Orleans Sewerage and Water Board (S&WB) settled a lawsuit filed by the U.S. EPA to force the city’s sewer system to comply with pollution control regulations . The S&WB was found in violation of the Clean Water Act and the Clean Air Act . The aging sewer system alone would cost $455 million to repair and while federal grants were possible, they were only available up to $100 million so the City would need to raise the balance locally . In October 1998, S&WB asked city council to approve a 42% sewer fee increase staged in five annual increments to help raise the money needed for sewer system repair. After intense debate, city council approved a one step 30% sewer fee increase in March 2000. This fee increase, however was not enough to meet consent decree requirements, putting S&WB and the city government in danger of incurring fines as high as $10,000 per day for violating the consent decree . Shortly after this fee increase approval, the city proposed water privatization as the solution. Two large companies jumped on this opportunity: Vivendi (now Veolia) and Suez’s United Water. Suez Environment, the world’s second-largest water company, has been active in the U.S. water industry for nearly three decades under various names. In 2000, Paris-based Suez expanded its presence in the United States by purchasing United Water, one of the country’s largest water companies. Under the leadership of Suez, United Water has become the second-largest private operator of municipal water systems in the country. Large scale failures including sewage overflows and contaminated drinking water have scarred the track record of this company in recent years . Veolia Environment is the world’s largest water corporation providing drinking water to more than 101 million people and sewer service to 71 million people worldwide. Veolia Water is a fully owned subsidiary of Veolia Environment and is the largest private operator of municipal water and sewer systems in the United States serving an estimated 10.5 million people in 32 states . This proposal set off a year and half long pursuit and discussion of private management, operation and maintenance of the S&WB’s water and sewer system . Supporters of privatization identify benefits as a savings to consumers through cost control measures, the most efficient provision of water and wastewater utility service, and improvements in customer service, billing and collections . Public opposition to this proposal grew and stopped the deal before it ever began. A community coalition of 90 organizations formed, including churches, civic groups, senior organizations and environmental groups. The Water for All Campaign, ACORN and the Service Employees International Union (SEIU) Local 100 played key roles in building community power. Methods used included car caravans, lawn signs, door-to-door education and rallies . Arguments against privatization involve potential deterioration in customer service due to extreme cost cutting measures, the continued weakening of government oversight of essential services, the mounting evidence that the much touted savings for similar privatization projects have failed to materialize, and the limited success of privatization in the US and the world . The Urban Conservancy provided an analysis of privatization for the city of New Orleans and concluded that privatization of the city’s water services was not in the best interest of the citizens of New Orleans. They acknowledge the notion held by the city government that because it is a poor city, they have to take any offer of outside assistance. The Urban Conservancy argues that this mentality results in a weaker government beholden to outside organizations that are eager to manage essential services that were once the responsibility of the government and that these organizations have no loyalty to the community, only to their shareholders. As a result, the potential for mismanagement is very high . Possibly the most influential achievement of community activism was the organization of a local referendum that gave voters the power to approve or reject any privatization contract worth more than $5 million . In March 2002, voters were asked to decide whether the City Charter should be amended to require voter approval of decisions by the S&WB to enter into certain privatization contracts . New Orleans voters gave overwhelming support to amend the city charter . Following this success, both Suez and Veolia withdrew their bids citing the measures as being cost-prohibitive for them . Just a few months later, in October, the New Orleans S&WB voted to reject privatization . This represented a landmark victory for citizens of New Orleans over corporate greed when the largest proposed municipal water privatization in the nation was rejected by the S&WB. Wenonah Hauter, director of Public Citizen’s Critical Mass Energy and Environment Program stated that water privatization can foster corruption and result in rate hikes, inadequate customer service and a loss of local control and accountability . One study that was done on the effects of water privatization on cities across the nation showed that many jobs are lost and it was expected that only half of the currently employed would retain their jobs after privatization . Other No guaranteed water savings as a result of privatization, which would not provide any improvements to the current state of the New Orleans water and sewer issues. Why? Explain briefly. People came together quickly and effectively to stop a privatization deal before it even began, thus protecting themselves, their water and their community rights. 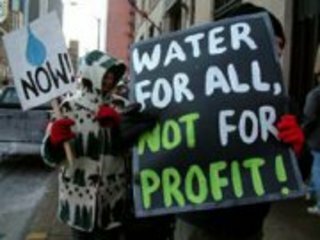 Water Privatization: An Economic Solution or Disaster?